Clayton was born in Whitehorse, and was raised in Atlin, B.C. After high school, he apprenticed in First Nation Studies in Vancouver, B.C., he worked with youth and has been making films since 1999. Clayton came to Teslin specifically for the film workshop! Today, Clayton filmed outside in the frosty weather and continued on his script. Cole created characters to animate. Doug also created characters but he made his out of wire and erasers. 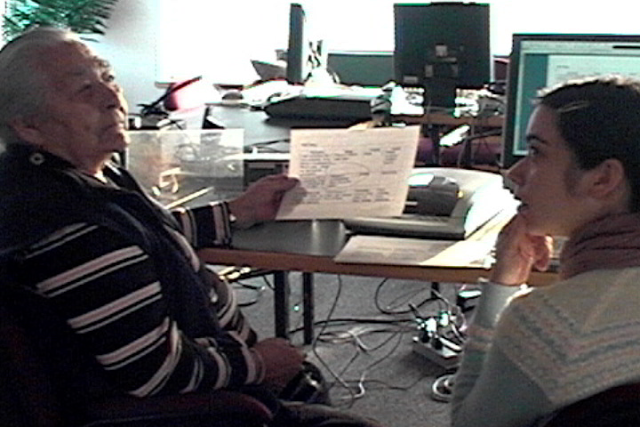 Pearl joined the workshop to help with Pat's Tlingit translation. Another day of A LOT of work.